It’s Christmas Eve! And, for my family, that means three of the major fattening holiday food groups; a 1950s version of Beef Stroganoff served over canned chow mein noodles, 1960s Layered Green Salad, and My Grandma’s Boiled Custard. In my immediate family, I am the only one who knows how to make it, and, at least two weeks ago, My Mother, My Sister, and The Daughter started asking me, “You’re making the custard, aren’t you?” Yes, not to worry. Never heard of Boiled Custard? It isn’t actually boiled, and, well, if you aren’t from Kentucky or Tennessee, let me explain. My maternal grandmother was a tee-totaler, a hard-working woman who was uprooted from her hometown in (very dry, alcohol-wise) eastern Kentucky and moved to Detroit in the 1920s, where jobs were plentiful and generally safer than working in a coal mine. She brought with her a love of quilting and family and cooking. Having corroborated her stories of our heritage at Ancestry.com, I wonder which of her recipes trace back to our ancestors who came through the Cumberland Gap from Virginia and North Carolina into Kentucky in the late 18th century. Most people have heard of chicken and rolled dumplings and cornbread (sugarless and made with white cornmeal, of course), hams cured with salt and vegetables cooked to death with every imaginable cured pork product, but outside of the area, few have heard of “boiled” custard. Every Christmas Eve after my grandfather died, she came to our house to spend the night and to make boiled custard. This is not the custard that you might think of, baked in little cups in a bath of hot water. This custard was drinkable. And it was spiked. Spiked by a woman who did not drink alcohol. Ever. Except on Christmas Eve. I suspect that it was originally made with good Kentucky bourbon, but, in the mid- 20th century, in Detroit, it was made with my dad’s blended Canadian whiskey. Grandma would stand at the stove, beating sugar into eggs and milk in the top of a makeshift double boiler. As the mixture thickened, she would gesture for My Dad to add a little of the whiskey. She would stir it for a minute, then taste it, and, invariably, gesture for Daddy to pour in a little more. The process took several minutes, during which my tiny little tee-totaling Grandma consumed enough uncooked whiskey to bring a little extra Christmas cheer into her life. When Grandma died in 1981, I decided that I needed to make it. Unfortunately, there wasn’t a recipe. I took some eggs, beat in some sugar, milk, and vanilla and used her double boiler. As the mixture cooked, I tasted it and added sugar. As it cooked, I stirred in the whiskey, as she did. When it was as thick as I remembered, I removed it from the heat. Alas, the eggs had over-cooked and curdled. I tried it again and didn’t overcook it, but it still had a weird, lumpy texture. Over time, I learned to strain it after cooking. I measured the ingredients so that I could reproduce it accurately every year. Instead of whiskey, I tried Southern Comfort and dark rum. Eventually, I went to bourbon, a Kentucky bourbon, of course. Oh! And in my version, the bourbon goes in just before I remove the custard from the heat. It’s still hot, but most of the alcohol is retained. Unlike Grandma, I like a lot of Christmas cheer at the holidays. Yes, we drank this as children, because, ostensibly, the alcohol had “burned off.” Tee-hee-hee! Naughty children, we never let on that it was potent. Of course, we were also children whose mothers rubbed our gums with whiskey when we were teething, so we were already ruined by the Demon Spirits. I don’t recommend my version for children because it isn’t nearly as benign as Grandma’s. Ladle some into a heat-proof measuring cup for the kiddies. Keep the good stuff for yourself. Why did they cook it? Perhaps it was to ensure safety on the frontier. Salmonella can be killed at 145° F. Perhaps just to thicken it. Why didn’t they use cream? Who knows? Let me know, if you do. Don’t get chintzy on the quality of the vanilla, because it adds to the flavor, significantly. I keep three different vanilla brands (plus vanilla beans and paste) in my over-stocked larder. One of the three is clear, artificial, and used in decorator’s icing, where the color is more crucial than the flavor. You can speed up the cooking process by warming all but two cups of the milk. If you add hot milk to eggs, they will cook. Use a clean candy thermometer (I have a separate deep frying thermometer to avoid grease contamination). Technically, you can cook the mixture until it just coats the back of a spoon (you can see a trail when you run your finger through it), but I find that an imprecise way to cook and too “frontiersy”. It may have worked for Grandma, but it doesn’t always work for me. This looks like a LOT of bourbon, but, consider that the recipe makes about 70-ounces. This translates into one ounce of bourbon for every 8-ounce cup of custard. Surely, you wouldn’t put less than a shot (1½ ounces) in a drink, would you? Why do you think Santa is so jolly when he leaves my house? Note: If your double boiler is smaller than mine (which holds the entire ½ gallon), make it in two batches. Whisk the sugar thoroughly into the eggs. Whisk in 2 cups of cold milk and pour into the top of a double boiler, sitting over simmering water. Whisk in remaining cold or warm milk. Stir constantly, until the mixture reaches 160°. Pour in the bourbon and stir until the mixture reaches 170°. Immediately remove from heat and pour into a heat-proof container (I use three, to speed up the cooling process) through a very fine sieve (I use a Chinois) or a strainer lined with cheesecloth, to remove any coagulated egg whites or yolk. Cover and refrigerate until cold. (It thickens as it cools, so don’t overcook it.) Uncover and whisk the mixture. Re-strain into serving container. (I save the plastic milk container so that I can shake it up.) Top each serving with a fresh grating of nutmeg. Grandma’s 1930s double boiler fits snugly into my 1980s stock pot. In the photo at bottom right, you can see the coagulated egg remains strained through the Chinois. Categories: Christmas, Food, Holidays, Humor, Now & Then, Recipes | Tags: boiled custard, bourbon, Christmas, eggnog | Permalink. I try to keep everything simple at Christmas time, otherwise, I’m easily stressed out by shopping and gift-wrapping, Christmas cards, decorating, food, and parties. Maybe not parties. I love parties. I’ll do my little bit of shopping, and I think I’m going to use every leftover Christmas card from the ghosts of Christmases past. Surely, you don’t remember what I sent you five years ago, do you? I’ll put my tree up a week before Christmas (yes, I realize that would be, like, now) and pull out my nativity on Christmas Eve. But I’m not a big holiday baker. I don’t get the appeal of Christmas cookies. On Facebook this week, many of my beautifully organized friends are posting photos of their scrumptious cookies and advertising cookie parties. I admire them, and I told one of them, “You’re a better woman than I,” because, really, isn’t that what you’re supposed to do at Christmas, bake beautiful cookies from family recipes to warm the heart and resurrect fond memories of Christmas past? Oh, I am such a cookie Scrooge. In early marriage, I made rolled butter cookies and spritz cookies, because I thought you just had to provide your family with cookies at Christmas. My Mother did. I just don’t have the patience. It takes you days on end to make about 500 dozen cookies, and they’re all eaten within a few days. If I had to go to a cookie exchange and take a recipe, the other bakers would be pretty disappointed. I’d either take my non-traditional chocolate chip cookies (with coconut and chopped pecans) or my oatmeal cookies. Those are the only cookies worth making, and I only make the chocolate chips once a year, at the most. I only like crispy cookies (hence the hint of coconut in the chocolate chips to give them a little extra crunch). Crispy peanut butter cookies are good (slightly burnt), as are crispy lemon, and lace cookies and even those little French almond tuiles, which you cool around a wine bottle to look like a roof tile. But, they’re all too much trouble for me, the lazy baker. Cookies? Meh. You might as well buy a package at the grocery store. Good luck with that. I wanted to show you a picture of the perfect Christmas cookie, as opposed to the lame ones that I would make, so I went to my local Wegman’s, which knows how to bake dozens of different breads with just the right crust and elegant tarts with crystalline glazes. Apparently, a color-blind person was decorating the Christmas cookies. The icing on the snowmen cookies was slightly yellow, and we all know what yellow snow means. The Christmas tree cookies were olive green, as if they had been standing in the living room on the 13th day of Christmas and were about to go up in flames. The snowflake cookies were royal blue and sunshine yellow. And, worst of all, Santa wore a rosy lavender hat. All of the colors had a drab, gray cast, sort of like they got covered in soot when Santa fell down the chimney with them. Now, I’m a creative person. 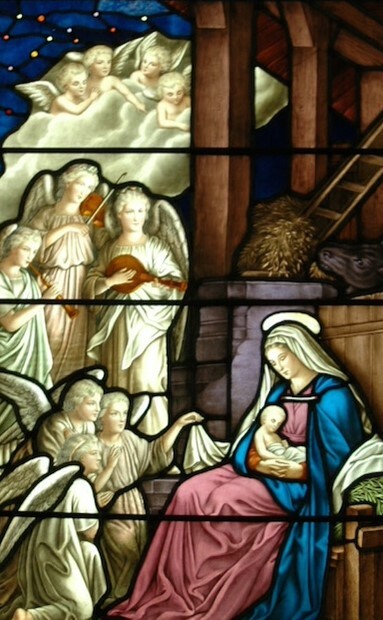 I appreciate different visions of the world, because that’s what adds joy to life, but, when it comes to Christmas, I’m a purist. I finally found a package of cookies that looked like someone cut them with Grandma’s cookie cutters and sprinkled them with red sugar (Santa) and green sugar (trees). They even had cookies for idiots like me that were entirely plain and labeled, “Decorate-it-Yourself”. I, however, rolled my cart over to the dairy section and bought a roll of sugar cookie dough for $2.99. It showed them sliced and baked and in the shape of stars. I assumed that the dough could be rolled and cut. How else could you get that star shape by slicing a roll of dough? 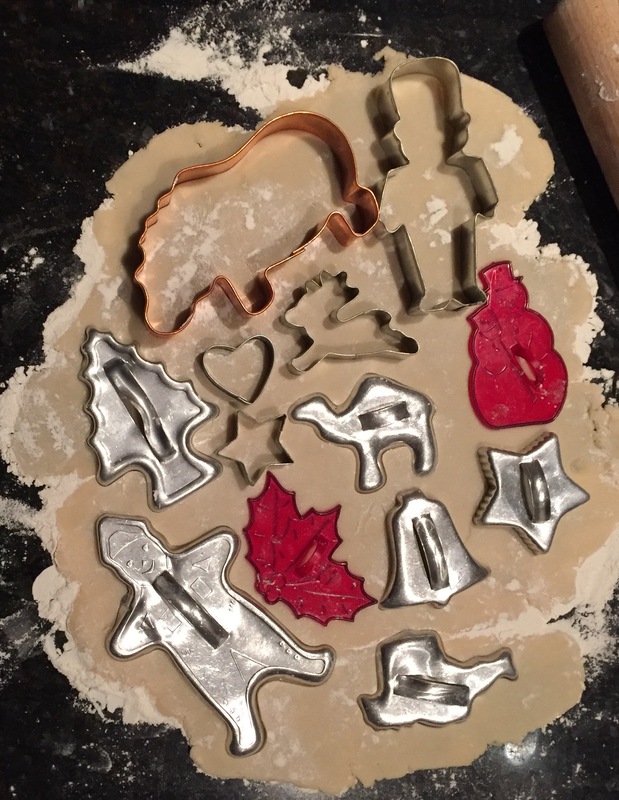 I hauled out cookie cutters that hadn’t seen the mini-lights of Christmas in decades, 13 in all, a baker’s dozen. Two red plastic ones belonged to my grandmother and must date to the 1940s or 50s. The aluminum ones are early marriage, c. 1972. The Nutcracker is from the 80s; the hippo from a set of animal cutters I acquired from Williams-Sonoma in the 90s. With enough flour on the granite counter, the dough rolled out to 1/4″ easily, although it seemed a little soft. 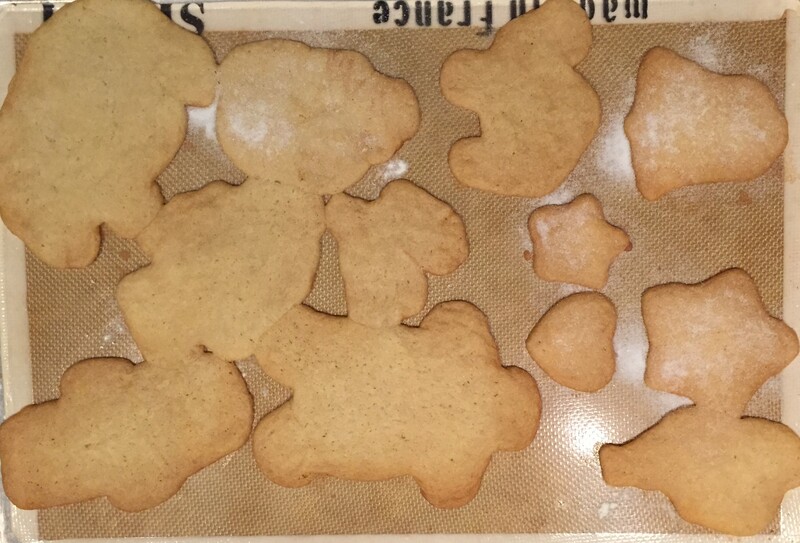 I carefully pressed the cutters into the dough, then removed the excess from around them and removed the dorky hat from the gingerbread man. I slid a metal turner under each cookie and eased it onto the cookie sheet. They all made the transfer except the red plastic holly. The dough clung to little ridges inside the cutter. So much for lucky number 13. Unfortunately, they didn’t smell like butter or sugar or vanilla or lemon extract, just commercial cookie dough. I decided to brush them with my cure-all for baked goods, Grand Marnier, and popped them into the oven. Uh-oh — they were too close together and turned into Pangea; you know? That supercontinent from which all the other continents broke off? Santa appeared to be delivering a star. The Nutcracker oozed into an aerial view of a sports car with its doors open — or a feminine hygiene product with wings, maybe. (I’m an eHarmony reject, remember?) They browned beautifully, but they still tasted like commercial cookie dough, a real waste of Grand Marnier. I pulled them apart. One cookie stole my heart. 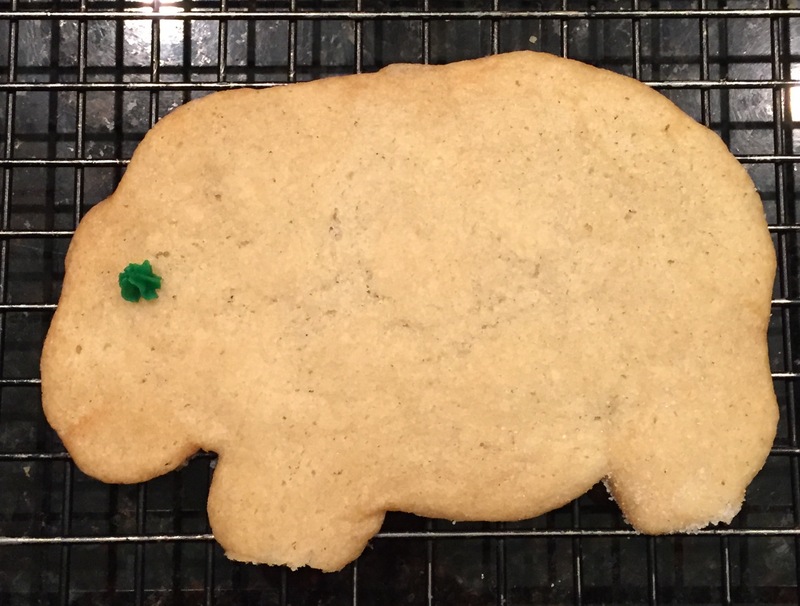 I’ve always wanted a hippopotamus for Christmas. I want a hippopotamus for Xmas! I’m not entirely down on commercial cookie dough. You may recall that I keep Nestle’s Tollhouse cookie dough in my freezer for emergencies — like when I don’t have anything else to eat for breakfast. I break off four little cubes, bake them in the convection oven until they get soft, and then flatten them with a fork, so they’ll get crispy. I also push two pecan halves into each cookie. Voilà! Home-baked cookies! If you’re as lazy as I am but need to leave something for Santa, my oatmeal cookies are the perfect choice. You dump the ingredients into a food processor and drop them onto a cookie sheet (use a silicone mat so you don’t even have to grease the pan). Santa would appreciate them with a glass of spiked eggnog, I’m sure. Nothing like a little fiber after a long night in the sleigh. The number of cookies varies according to the size of cookies that you make. An ice cream scoop makes a big fat chewy cookie — the kind that keeps Santa and Rudolph strong all night long. A tablespoon makes a smaller, crisper cookie — my fav! Preheat oven to 350°. Prepare cookie sheets either by greasing or just use a silicone baking mat. In food processor, cream sugars and butter. Add egg, vanilla, and milk. Pulse until blended. Add all remaining ingredients except the oats and pulse just until moistened. Add oats and pulse twice, just to evenly distribute the oats. Didn’t I tell you it was easy? Ho-ho-ho! Merry Christmas! Categories: Christmas, Food, Holidays, Humor, Recipes | Permalink.